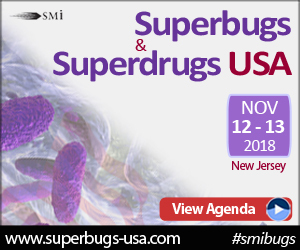 SMi Reports: An exclusive interview with Dr. Antonio DiGiandomenico, Principal Scientist at MedImmune on challenges and his vision for the future of AMR R&D has been released in the run-up to the 3rd annual Superbugs & Superdrugs USA Conference taking place in Iselin, New Jersey on November 12 – 13, 2018. SMi Group is proud to present some insightful content to you, who will be speaking at the 3rd annual Superbugs & Superdrugs USA Conference, a leading scientist in AMR R&D: Dr. Antonio DiGiandomenico, Principal Scientist, MedImmune. SMi caught up with Dr. DiGiandomenico to talk about his role in the field, his vision on challenges and the future for the development of novel anti-infectives. Dr. Antonio DiGiandomenico is currently a Principal Scientist in the Department of Microbial Sciences at MedImmune/AstraZeneca and has 20 years of experience in microbiology and immunology. What do you see as the greatest hurdle to developing novel and effective anti-infectives? Cost to develop novel drugs is a major drawback to large pharma due to the lack of incentives, which factors from: 1) an overall public perception that antibiotics need to be cheap. 2) the rate of antibiotic resistance development can be so fast that there could be widespread resistance shortly after a new antibiotic reaches the market. 3) broad-spectrum antibiotic usage is detrimental to the host and should only be used in special circumstances. To start, regulatory agencies need to develop a path for the development of narrow-spectrum drugs. In addition, there should be greater incentives for the development of novel anti-infectives. The US is behind their EU counterparts in implementing similar to Innovative Medicines Initiative programs, but there is current movement in the positive direction with the recent introduction of the Antibiotic Resistance Leadership Group (ARLG). What would you say is the biggest barrier to implementation of novel anti-infectives in common treatment plans and the commercial market? I firmly believe that the novel anti-infectives of the future will be those that target a limited number or single pathogens. Join Dr. Antonio DiGiandomenico this November as he will be presenting: ‘Immunotherapeutics Targeting Pseudomonas Aeruginosa Acute and Persistent Infections’. The presentation will introduce novel anti-Pseudomonal mAbs and their mechanisms of action. Activity will also be discussed in multiple animal models when used in both prophylaxis and treatment indications. Dr. DiGiandomenico will also address synergy with antibiotic treatment and activity against biofilms.